Beautiful stock certificate (#41) from the Boston Library issued in 1853. This historic document has an ornate border around it. This item has the signatures of the Company's Treasurer, Charles Browne and Librarian, J. J. Stevens and is over 165 years old. 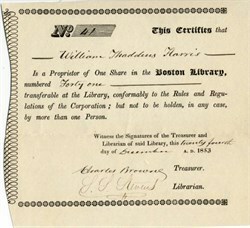 The certificate was issued to William Thaddeus Harris. The Boston Library Society was an American subscription library established in New England's pre-eminent city, Boston, during 1792. Early subscribers included Revolutionary War figures Paul Revere and William Tudor. The society existed until 1939 when it merged into a larger historical library known as the Boston Athenæum. 1792�1858 The Boston Library "circulated polite general reading for ladies and gentlemen". It operated from rooms in the newly built Tontine Crescent, designed by Charles Bulfinch, who also served as one of the library's trustees. Early subscribers, in addition to Revere and Tudor, included: Hannah Barrell, James Bowdoin III, Dr. Thomas Bulfinch, Rev. John Clarke of First Church, Abigail Howard, Sally Hubbard, Deborah Jeffries, Mary Langdon, Jedidiah Morse, Sarah Wentworth Apthorp Morton, James Perkins and Thomas Handasyd Perkins. The library maintained detailed records of its holdings and circulation activities. For instance, in 1794, Paul Revere borrowed works by Chevalier de Jean Francois Bourgoanne, Elizabeth Inchbald, James Cook, William Coxe, Elizabeth Craven, Charles-Marguerite-Jean-Baptiste Mercier Dupaty, Edward Gibbon, Alexander Jardine, Johann Kaspar Lavater, William Shakespeare, Joshua Townshend, and Comte de Volney. In the first years of the library, Nathan Webb served as secretary, 1794�1826. Henderson Inches, Allan Pollock, William Walter and Charles Hammatt were successive treasurers. Librarians included Caleb Bingham (1792�1797), Nathan Davies (1797�1803), Cyrus Perkins (1803�1806), James Day (1809�1811), Charles Callender (1813�1828), John Lee (1828�1840) and George S. Bulfinch (1840�ca.1845). Numerous trustees, in addition to Charles Bulfinch, supported the library through the years, including Reverend Joseph Eckley of Old South Meeting House, Reverend John Eliot, Reverend William Emerson, Samuel Hall, John Thornton Kirkland, George Richards Minot, Bishop Samuel Parker, William Scollay, Lemuel Shaw, William Spooner, Charles Vaughan and Redford Webster. In 1801, Abigail Howard donated some 500 books to the library. By 1848, the library owned "about 11,000 volumes, which have been obtained chiefly by purchase". William Thaddeus Harris, eldest child of Thaddeus William and Catherine (Holbrook) Harris, was born January 25th, 1826, in Milton, Massachusetts. He suffered from a congenital curvature of the spine and lifelong frailty. He entered Harvard College in 1842, excelling in Latin and philosophy and received his A.B. in 1846 and LL.B. and A.M. degrees from Harvard Law School in 1848. He became editor of the New England Historical and Genealogical Register in 1849, and later worked as a librarian at both Harvard College and the Boston Athen�um from 1850 until 1851. An ardent student of genealogy and local history, he published Epitaphs from the Old Cambridge Burying Ground in 1845 and was subsequently engaged by the Massachusetts Historical Society to revise the manuscript of Hubbard�s History of New England for its 1848 reprinting. He later transcribed the epitaphs of the old burying ground in Watertown, to be published by his brother Edward in 1869 as Epitaphs from the Old Burying Ground in Watertown. In 1853 William Thaddeus Harris was admitted to the Massachusetts Bar, though he never practiced law. William Thaddeus Harris succumbed to illness on October 19, 1854, at twenty-eight years of age.